What is learning? In my opinion, learning is changing behavior. A team leader can change a team's behavior with new goals, training, motivation, rewards, incentives and leadership. 'Our nation's long-term ability to succeed in exporting to the growing global marketplace hinges on the abilities of today's students. "J. Willard Marriott, Chairman and CEO, Marriott International, Inc.
Teamwork is an essential skill that students need to learn when entering the workforce. The Corporate Learning Institute's team building training programs: Team building is about increasing motivation, improving communication, and building trust within each other while committing to and reaching a common goal. The Corporate Learning Institute has specialized in creating interactive Team Building Programs to deliver enhanced results and accomplish what other programs fail to do. Corporate Learning Institute provide fun to strategic team building events designed to increase the performance of your people and organization. The Corporate Learning Institute's team building training programs teaches, inspire, renew and challenge your people to become powerful performers. This expert consultation and facilitation ensures that participants learn the skills at our team building training programs that are critical to their success back at work. By providing these team-building services, our ultimate goal is to help you achieve both personal and organizational success. The Corporate Learning Institute provides customized Team Building Training and development workshops, strategic team building retreats, high ropes courses, fun team building events, DiSC or MBTI assessments and intense team building programs. For maximum return on investment, Corporate Learning Institute team-building services are custom-designed to help you achieve the team building goals of your organization. SYNERGY LEARNING SYSTEMS' TEAM Developing teams requires skill and intention to achieve maximum potential. Synergy Learning Systems' team building programs are hands-on and highly interactive, fully engaging both the mind and the body to insure that teams are able to meet the twists and turns of business in the new millennium. One of the most powerful methods for adults to learn is the use of challenges that engage participants in experiential learning, a learning process that involves action, reflection, generalization and application. Following each team challenge, a facilitated discussion helps team members move quickly through the learning cycle and make course corrections on the spot. "When I am green, I am growing and when I am ripe, I start to rot"
Life long learning; I tell my students that change will be constant in our life, so we need to learn how to learn. HRDQ can help you out. Click to find out more about the tools they have for teambuilding. I use them and they work. Learn more about SBI and how you can start an e-business. You are a member of a space crew who has crash-landed on the planet of Acrab. After being taken captive by aliens, the only way you can escape is to rebuild your transformational girospeckter. But can your team solve the alien's puzzles quickly enough to repair your spaceship and get away? Experiencing: Formulating ideas and gathering information during the learning experience. Sharing: Articulating the learning experience to other participants. Interpreting: Understanding the skills and behaviors experienced. Generalizing: Developing testable hypotheses from the learning experience. TeamBuilders also addresses critical secondary skills such as trust, managing diversity, assertiveness, influence, conflict management, negotiating, and more. Activities may be used independently or paired together as part of team training. Organized in a 3-ring binder, each TeamBuilders simulation contains background information and facilitator instructions, as well as reproducible participant materials including role-specific briefing information , observer instructions, discussion questions, and a team skill handout. TeamBuilders also includes a CD-ROM containing printable files of the reproducible participant materials. For a long time I've wanted to publish a book about how teachers made a difference in the lives of their students; because I know they made a difference in mine! I grew up in Trenton, Tennessee, a small town of 5,000 people. I have wonderful memories of those first 18 years. And during those years there were two teachers who I can say, with certainty, helped to make me who I am today. The first was Ms. Bridges who taught me in the 4th grade. She was amazing! I'll never forget her beautiful smile and her passion for teaching. She made learning so much fun and made all of us feel like we could do anything we wanted to do. The positive seeds she planted in my head are still growing! Then there was Fred Culp, my history teacher in high school. To this day, he is still the funniest person I've ever met. In addition to loving his history class, he taught me that a sense of humor, especially laughing at yourself, can be one of life's greatest blessings. 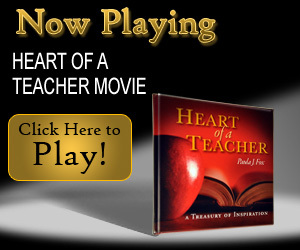 So if you're a teacher, or if, like me, your life was greatly influenced by a teacher, you're going to love this movie! The beautiful poem, The Heart of a Teacher, was written by Paula Fox. The combination of words, music and photographs is a "wow" that you won't soon forget! Accelerate learning and improve knowledge transfer by adding simulations to your training line up. There isn't a more effective or engaging way for learners to practice and develop their skills. Here are four great simulations - each with a special offer to get you started! Strike Fighter NEW! Simulated negotiation. Real-world skills. Team Adventure Series Journey to synergy. Reproducible Simulations Library NEW! 24 customizable scenarios. Unlimited use digital download. One low price. Junkyard Games The outrageously fun innovation simulation. Beware of the man who works hard to learn something, learns it, and finds himself no wiser than before. ~Kurt Vonnegut, Jr.